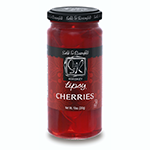 Sable & Rosenfeld Whiskey Tipsy Cherries are 'Cocktail ready', long stemmed, colossal cherries spiked with malt whiskey. Perfect for the classic Manhattan and the trend setting vogue martini. Great as an hors d'oeuvre garnish. INGREDIENTS: cherries, high fructose corn syrup, water, potassium sorbate (preservative), sodium benzoate (preservative), citric acid, natural & artificial flavor, FD&C red #40, sulfur dioxide (preservative), whiskey.